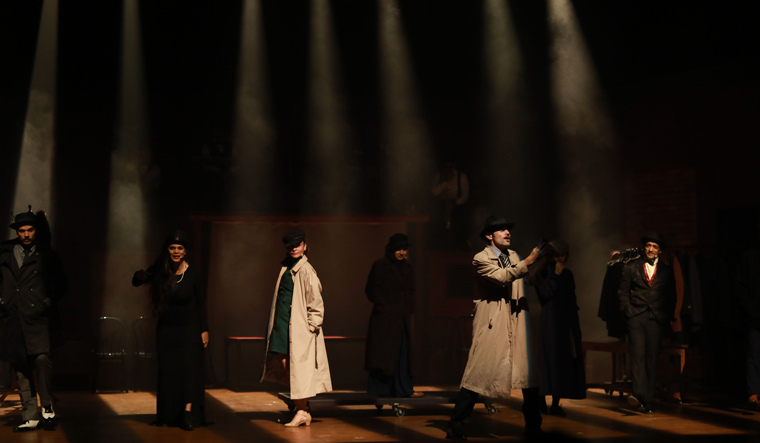 A homage to Hitchcock's brisk comedy thriller The 39 Steps and a delightful riff on the title of Dev Anand's Hollywood-inspired Nau Do Gyarah, The Company Theatre's latest Detective Nau-Do-Gyarah is all things fast, furious and fun. Actor, director, playwright and founder of Mumbai-based The Company Theatre Atul Kumar has transposed the plot premise of Hitchcock's famous 1935 film set in Britain to Bombay's art-deco jazz age, with the Royal Opera House an integral setting in a gag-laden plot spanning the mafia and an international spy ring. The charming and urbane psychiatrist, Shekhar Kumar, suddenly finds himself implicated in the murder of a spy after he rescues a fetching damsel-in-distress at the Opera house. The play channels this trope of an-innocent-man-on-the-run to trace Kumar's breathless bid to prove his innocence from his Khandala apartment through train stations, seedy lodges, smoky bars, choking roads, and luxury-liners. This is high-stakes adventure. At one end, there's murder, deceit, military secrets and nation-at-stake paranoia, even the KGB. On the other hand, there are feisty femme fatales, sleazy gangsters and some golden-era cabaret. This heady cocktail is overladen with bumbling cops and dramatic chases, smooth bluesy music and high-energy drumming, Chaplinesque acts and stylised, caricature-like flourishes drawn from old Indian films before Bollywood. The director's love for graphic novels, detective fiction, noir films, black-and-white Indian cinema and old Hollywood has been deftly woven in to create theatre which has achieved much in technical finesse and stage design. A live band with its saxophones, drums and trumpets amply aids and enhances the action on stage, complimenting the dreamy visual landscape with sudden bursts of bright red and yellow lights. A cast of 12 performers prance from farce to comedy to slapstick to stunts, especially when they hurtle in crowded steam trains and negotiate precipitous bends in unnerving street chases. All seem to be having a good time trying to recreate, in closest possible approximations, the dense, hectic plotting of an action-packed espionage thriller, failing and persisting all the same. The actors and backstage crew mingle, slide in and out of scenes, changes lights and costumes on stage. And the are plenty of ravishing costumes, specially rows and rows of glamorous trench-coats and hats laid out in the background for the sake of nostalgia. The sudden appearance of a chugging toy train, pushed along by actors and that headless, reedy human in a cloak-like coat holding out the rotary retro telephone for Kumar were some memorable touches. The casting of Anna Ador as the Hindi-speaking Russian spy was particularly on point. Detective Nau-Do-Gyarah starring Niketan Sharma, Neil Bhoopalam, Gagan Dev Riar among others, is the first of four plays in the 2018 edition of Aadyam, a theatre initiative by the Aditya Birla Group. Currently in its fourth iteration, the acclaimed festival showcasing fresh, technically suave productions every year, has roped in veteran thespian Shernaz Patel as its new artistic director. While Detective Nau-Do-Gyarah wrapped up its Delhi tour on August 4, Hello Farmaaish by Yuki Elias is next in line on September 23.